“One More Murder” is a song I can play on repeat 10 times in a row. It’s got an intense hook. It has dark lyrics and was featured on the excellent television series Homicide. Love it. Also enjoy the super upbeat “Like it Like That” and “At the Stars” off the same 1998 album How Does Your Garden Grow. 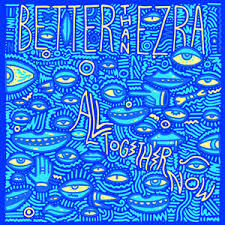 I generally think of Better than Ezra as one of those semi-non-descript white bread bands. They write a couple of hits but nothing particularly stands out for me that I can distinguish their non-hits from Dave Matthews Band or Maroon 5. You could almost intermingle those bands and I’d hardly know the difference if it’s not a hit song. But mediocrity sells. Not many people dare to be on the fringes, they’d rather remain in the safety of the familiar mediocrity. It’s why Modern Family and The Big Bang Theory are popular television shows. The band’s seventh album, All Together Now, is a mixed bag. The Americana-twinged, sweet smooth “Crazy Lucky” possesses a cool edge particularly the way Kevin Griffin sings crazy with his laid-back southern accent. The super catchy “Undeniable” with its piano melody and choppy singing might be the best song on the album. It’s clever and unusual. The fast-paced rather groovy “Insane” spins and rolls with upbeat goodness. “Gonna Get Better” and “The Great Unknown” are rather bland quickly forgettable songs that would only sound good in the background of a bar. Positive that Better than Ezra would be a marvelous good time live. They’ve written some hits, some solid songs when they want to it’s just that sometimes they don’t put in the effort so you get a less-than album. A shame. These might be one of those albums where people buy per single. I hear that’s what the kids are doing anyway. This entry was posted on August 30, 2014, 17:27 and is filed under Music. You can follow any responses to this entry through RSS 2.0. Both comments and pings are currently closed.